Editor’s note: This is TechHive’s original Sling review. It has been updated in its entirety, and our new review—published after using the service for more than a year—can be found here. Sling TV changed my TV-viewing habits in less than a week. Since my family ditched cable TV six years ago, the television has become less of a fixture in our house. We still use Netflix and a handful of other apps on occasion, but the process of finding something to watch often feels like more trouble than its worth, and many evenings go by where I turn to my phone or tablet for entertainment instead. Dish Network’s Sling TV, a $20-per-month service with live access to ESPN and 10 other cable channels, brought back the couch potato element that’s been missing all these years. It’s so easy to just turn on something—anything, really—that our overall TV usage has skyrocketed. Sling TV fills the gaps where on-demand seems, well, too demanding. This phenomenon may not be particularly interesting to cable-TV subscribers, but Dish Network hopes Sling TV will appeal to people who’ve abandoned pay-TV service or never had it in the first place. Sling TV shows promise as a source of live TV for considerably less money Dish’s satellite service, though it has lots of rough edges right now. Before we dive into how the software works, let’s go over what Sling TV’s $20 per month subscription fee gets you. The base package includes 11 live channels: ESPN, ESPN2, TNT, TBS, Food Network, HGTV, Travel Channel, Cartoon Network/Adult Swim, Disney Channel, ABC Family and CNN. A subscription also includes access to the WatchESPN app, which includes many more games than what you get through the main feed. It’s not quite standalone ESPN streaming, but it’s as close as you’re going to get for now. If those channels aren’t enough, you can add more in bundles, each of which costs an additional $5 per month. “Kids Extra” adds Disney Junior, Disney XD, Boomerang, Baby TV and Duck TV, and “News & Info Extra” adds HLN, Cooking Channel, DIY and Bloomberg TV. 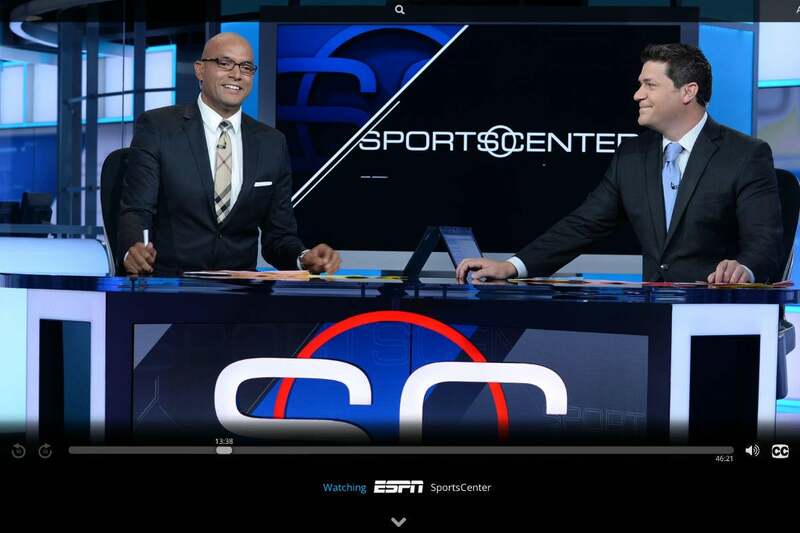 Sling is working on a “Sports Extra” package as well, but this wasn’t available for testing. Some on-demand movies are also available for rental, though you’ll likely find a more comprehensive selection elsewhere. For better or worse, Sling TV does not include basic networks like ABC, CBS, NBC and Fox, so you’ll still have to get them the old-fashioned way: With an antenna. While that’s less convenient than having a single app for everything, it does help keep the cost of Sling TV down. Update: Sling TV is now available to all subscribers. The service has also added AMC to its lineup, so fans of shows like The Walking Dead and Mad Men can see episodes of those shows live. There’s no DVR service, but some channels include an impressive feature called “Replay,” which lets you scroll back in time to any show from the past three days. These channels also include a selection of on-demand shows, and allow you to pause, rewind and fast forward whatever you’re currently watching. The problem is that out of the 11 channels in Sling TV’s basic lineup, only three (Food Network, Travel Channel and HGTV) offer Replay. The channels that choose not to support this feature won’t let even let you pause or rewind the current show, and they don’t offer any programs on demand. This just illustrates how skittish some networks are about disrupting the cable-TV experience. 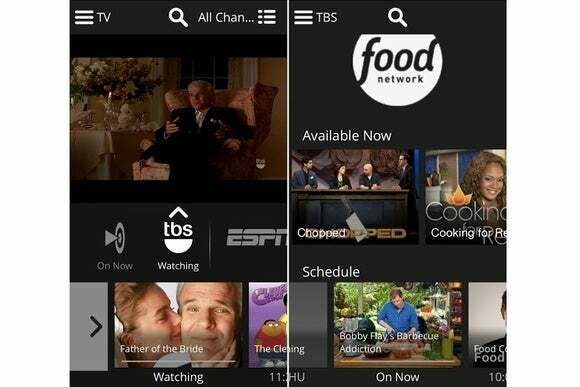 Sling TV’s mobile apps aren’t much different from the big screen versions. As for app support, Sling TV ran on Roku, Android, and iOS during my testing. Apps for Xbox, Amazon Fire TV, Android TV, select smart TVs, and desktop web browsers are on the way, but there’s no official word on Chromecast or Apple TV support. The traditional cable guide makes sense when you have hundreds of channels to sift through, but Sling TV only has 11 channels in its base package, so it rightfully strives for something simpler. When you launch the app, the video takes up the full screen, with a translucent channel guide overlaid on the bottom half. 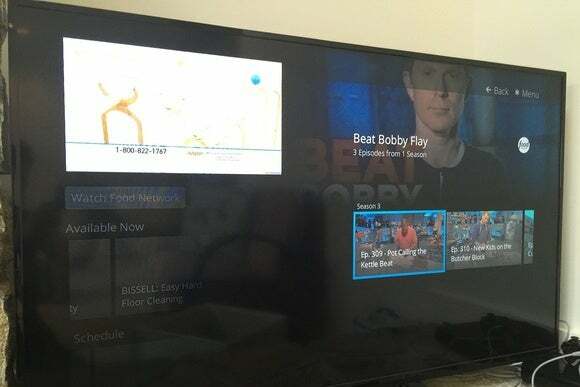 Scrolling left or right cycles through each channel, showing the current show, the upcoming schedule and previous shows (if Replay is supported). You can also flip through channels in full screen mode by pressing up or down on the remote—just like the old days. It’s not as efficient as a standard cable guide’s dense grid, but it doesn’t have to be, and it’s nice to have the video stay in full screen as you browse. My only gripe is that the text descriptions for each show were too hard to read, even on a 50-inch TV from 10 feet away. From the guide, you can scroll up to see more from the current channel, shrinking the video down to thumbnail-size and letting you browse through on-demand and upcoming shows. This part of the interface could use refinement, as you can’t view an on-demand episode’s description without selecting it. Those details should just pop up as you scroll through. Sling TV’s on-demand menu has plenty of unused space where episode descriptions could go. I also wish there was a way to control Sling TV from a phone or tablet. Given that the service has nearly the same interface on mobile devices as it does on the television, it seems like an obvious feature to add down the road. When you think of Internet TV, you might imagine a nightmare scenario of buffering, choppiness, and resolution drops. Fortunately, that wasn’t my experience with most of Sling TV’s live channels. Each channel only took a few seconds to load, and would begin playing at a high resolution with only rare exceptions. ESPN was particularly impressive, delivering the same smoothness of motion that you’d get from cable. (Be warned, however, that ESPN’s feed has no commercials, which sounds like a blessing until you’ve heard the cheesy “commercial break” groove for the 20th time in a day.) The only channel that wasn’t up to par was HGTV, whose audio was noticeably out of sync with the video. On-demand video wasn’t nearly as pleasant. Some videos failed to play at all, and every episode ended a few seconds before its actual conclusion. Sling TV also seemed to resist fast forwarding on my Roku 3, not allowing me to skip ahead by more than 10 seconds at a time. The only way to get through a commercial break, then, was to mash the fast forward button over and over again. One other nitpick: Sling TV’s on-demand listings include the paid programming that shows up in the early morning hours, which seems like a waste of space. If you have a capped data plan from your Internet service provider, you might also want to be mindful of your Sling TV use. Because the experience is so much like cable TV, it’s tempting to just leave the TV on all day, or turn the TV off without actually exiting the Sling TV app. At around 4Mbps for the high-quality feed, this will speed you toward your data cap in no time. 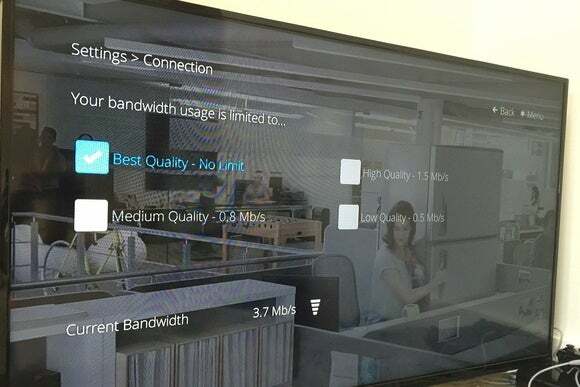 Sling TV’s settings do allow you to reduce video quality to save bandwidth and data consumption, at least. Users dial down streaming quality to steer clear of data caps. Sling TV is a new and unique service, so a lot of these woes should be fixable. And because the core live TV service works so well, I’m not questioning Dish’s decision to launch Sling TV broadly in the next week or two. (People who pre-registered are starting to gain access now.) I will, however, keep an eye on the service after launch to see if the influx of new users causes any major issues. Is Sling TV worth the $20 per month subscription? The answer for everyone will be different, and it will depend on how much cable TV costs in your area, how much you care about the channels Sling TV offers, and how much you crave live programming as a fixture in your living room. In any case, I’m pulling for Sling TV. No one knows whether a small channel bundle like this can succeed, or whether it’ll blow up the pay TV industry in the process. But in offering this service, Dish is taking a bold step into the unknown. I hope it never looks back. At a glance from the original review: Sling TV brings back the linear video element that other cord-cutting services lack, but could use some polish and a few more features. Steady improvements have turned Sling TV into a great budget streaming bundle—with a few lingering frustrations. Jared writes for PCWorld and TechHive from his remote outpost in Cincinnati.